At the Roger Smith Hotel in New York, social media has become immersed within the hotel’s unique culture. 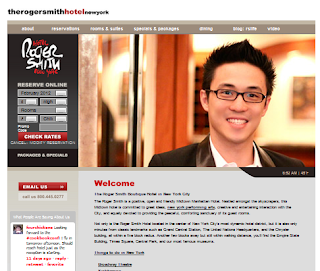 At its core, the Roger Smith Hotel is about storytelling — with a focus on art and people — and social media has become the way in which the hotel can share these stories and create new ones. Simpson points to an event from 2009 as a catalyst for some of its creativity. The artsy hotel then hosted a Social Media Breakfast, which led to interest from other social media and web groups, and ultimately inspired Simpson to actively immerse himself in the social media culture. The hotel is also being extremely avant garde with its approach to installation art. They’ve commandeered an art studio on Lexington Avenue outside the hotel and turned it into an experimental space where art meets social media. The space is dubbed the RS Pop-Up Shop, or RS POP, and it’s open to up-and-coming designers and artists who want to showcase their work with social media flair. Each selected RS POP participant is heavily supported with social media exposure, so artists and designers are featured both in the art studio and online via the hotel’s social media channels.